Cross-presentation of cell-bound Ags from established, solid tumors to CD8 cells is efficient and likely to have a role in determining host response to tumor. A number of investigators have predicted that when tumor Ags are derived from apoptotic cells either no response, due to Ag “sequestration,” or CD8 cross-tolerance would ensue. Because the crucial issue of whether this happens in vivo has never been addressed, we induced apoptosis of established hemagglutinin (HA)-transfected AB1 tumors in BALB/c mice using the apoptosis-inducing reagent gemcitabine. This shrank the tumor by ∼80%. This induction of apoptosis increased cross-presentation of HA to CD8 cells yet neither gross deletion nor functional tolerance of HA-specific CD8 cells were observed, based on tetramer analysis, proliferation of specific CD8 T cells, and in vivo CTL activity. Interestingly, apoptosis primed the host for a strong antitumor response to a second, virus-generated HA-specific signal in that administration of an HA-expressing virus after gemcitabine administration markedly decreased tumor growth compared with viral administration without gemcitabine. Thus tumor cell apoptosis in vivo neither sequesters tumor Ags nor cross-tolerizes tumor-specific CD8 cells. This observation has fundamental consequences for the development of tumor immunotherapy protocols and for understanding T cell reactivity to tumors and the in vivo immune responses to apoptotic cells. Antigens from peripheral tumor cells can enter the class I pathway for presentation by host APCs to CD8 cells, a process commonly known as “cross-presentation” (1, 2, 3). Cross-presentation has been the focus of much research over the past few years. It is an extremely efficient process and because it can induce either tolerance or immunity to Ags expressed in normal tissues, it is thought to have a role in the maintenance of self tolerance as well as the rapid clearance of viruses (2) although the overall importance of cross-presentation in vivo remains uncertain (4). It is unknown whether apoptotic or live cells are the source of cross-presented Ag in normal tissues (1). It is essential to understand the effects of apoptosis on tumor Ag cross-presentation in vivo because such knowledge is crucial for understanding how a host interacts with established tumors and, equally importantly, how the induction of apoptosis in tumor cells, e.g., by chemotherapy, alters the efficiency of cross-presentation and the response of tumor-specific T cells. In vitro, Ags from apoptosing cells can be cross-presented to specific CD8 cells via dendritic cells (DCs)5 and, in some studies, macrophages and B cells (5). Studies with APCs loaded with apoptotic cells in vitro then injected into mice have produced quite variable results, some demonstrating tolerance (6, 7, 8) and others priming of CD8 responses (9, 10, 11, 12, 13, 14, 15). An in vivo study of apoptosing pancreatic islet cells demonstrated the development of tolerance after cross-presentation of islet cell Ags (16), but no clear picture is available of what is likely to occur in vivo when tumor cells apoptose. However, what happens in vivo is important, because the outcome of cross-presentation of Ags derived from tumor cells that apoptose in vivo is likely to be critical for developing effective tumor immunotherapy approaches (17, 18). Therefore, it is crucial to establish methods of evaluating the in vivo host response to tumor Ags that are cross-presented from cells made apoptotic in vivo, and whether such a process induces tolerance or activation of responding CD8 cells. Most of the data describing the relationship between cellular apoptosis and T cell responses to Ags from such cells has been generated in part or in whole by cross-presentation experiments using in vitro systems, mostly undertaken to develop effective immunotherapy protocols (19). Although these experiments have provided important insights into APC phagocytic processes, APC subtypes, DC maturation pathways and the fate of ingested Ags, they use artificially grown APCs in a non-lymph node (LN) environment. Such experiments are essential for the development of adoptive DC immunotherapy protocols but they cannot be certain to predict the fate of in vivo apoptosing cells and their effect on host immune responses. This may explain why in vitro studies have produced variable results with regard to the capacity of apoptotic cells to be cross-presented by different host APCs. To determine whether Ags cross-presented from tumor cells which apoptose in vivo are sequestered from the host Ag presentation pathways and/or induce Ag-specific tolerance, we established a model using hemagglutinin (HA) Ag-transduced tumor cells, in which apoptosis could be pharmacologically induced in vivo using the false nucleotide agent, gemcitabine. This agent is ideal for studies of in vivo induction of apoptosis because it induces cell death by apoptosis, is relatively nontoxic, can be used in vivo, and its general effects on immune responses are well-described (20, 21, 22). The data in our study demonstrate that induction of tumor cell apoptosis in vivo not only does not sequester cell-associated Ags but actually increases tumor Ag cross-presentation, leading to priming rather than tolerance of tumor-specific CD8 T cells. BALB/c (H-2d) mice were obtained from the Animal Resources Center (Perth, Australia) and maintained under standard conditions in the Department of Medicine animal holding area (University of Western Australia, Perth, Australia). Two lines of anti-HA TCR transgenic mice were used. Clone 4 TCR transgenic mice (CL4; Ref. 23) express a TCR recognizing the dominant class I-restricted HA epitope. HNT TCR transgenic mice express a class II-restricted receptor that recognizes the dominant class II-restricted HA epitope (24). All mice used in these studies were between 8 and 12 wk of age. All cell lines were regularly tested and remained negative for Mycoplasma spp. The murine AB1 tumor cell line is a class I+, class II− tumorigenic malignant mesothelioma cell line (25). Cell lines were maintained in RPMI 1640 (Invitrogen, Carlsbad, CA) supplemented with 20 mM HEPES, 0.05 mM 2-ME, 100 U/ml penicillin (CSL, Melbourne, Australia), 50 μg/ml gentamicin (David Bull Labs, Victoria, Australia) and 5% FCS (Invitrogen). AB1 cells were transfected with the murine influenza HA gene as previously described (AB1-HA; Ref. 26). Expression of HA was measured by FACS analysis before use in each experiment. Gemcitabine-resistant AB1-HA (AB1-HA-GR 250) was generated by culturing cells in media containing progressively increasing concentrations of gemcitabine (Eli Lilly, Indianapolis, IN). At each concentration, the cell line was passaged until growth rates were the same as the untreated parent cell line before increasing the concentration of gemcitabine. This cell line was grown and passaged in a final concentration of 1.67 μg/ml gemcitabine. The IC50 as assessed by the colorimetric MTT assay was >800-fold that of the parent cell line. AB1-HA-GR 250 maintained equivalent expression of the HA Ag. AB1-HA or AB1-HA-GR250 tumor cells (1 × 106) were inoculated s.c. on one side of the ventral surface in the lower flank region. Treatment commenced 9 days later when a small palpable tumor was evident, ranging from 1–2 mm in diameter. Mice were then injected i.p. with 120 μg/g gemcitabine every third day for five doses, a regimen previously established as a maximal tolerated dose for BALB/c mice (27). Control mice received PBS vehicle alone. Mice were weighed before each dose and the dose was adjusted for individual mice. Tumor size was measured with calipers three times weekly during the course of chemotherapy and subsequently until tumor size reached ∼10 × 10 mm, at which point mice were culled. Adoptive transfer of transgenic lymphocytes was used to monitor changes in tumor-specific CD8 cell numbers in tumors by tetramer staining, lymphocyte proliferation assays, and changes in levels of in vivo CTL activity. Briefly, single cell suspensions of TCR transgenic lymphocytes were prepared from BALB/c HNT and BALB/c CL4 mice. CD4 lymphocytes were added to maintain CTL activity over the experimental time course (17). LNs were donated by i.v. injection 1 day before the first treatment dose. Cells were washed three times in PBS and counted by trypan blue exclusion after the third wash. Mice were warmed with a heat lamp and then briefly restrained for i.v. injection. Cells (1 × 107) of each of HNT and CL4 lymphocytes were injected in 200 μl. To follow the fate of individual T cells throughout activation and clonal expansion, the fluorescent dye CFSE (Molecular Probes, Eugene, OR) was used. Dilution of CFSE-labeled T cells was performed as originally described by Lyons and Parish (28). Single cell suspensions were prepared from LNs harvested from HNT or CL4 mice and labeled with CFSE. Experimental groups were injected i.v. with 200 μl per mouse. Sixty-six hours after transfer, experimental mice were culled and single cell suspensions were prepared from the draining LNs (DLN), contralateral LNs, mesenteric lymph nodes (MLN), and spleens. Analysis was performed on a FACScan using CellQuest software (BD Immunocytometry Systems, San Jose, CA). For analysis of CFSE-labeled cells, 100,000 events were collected and analyzed. Tetramers were made as follows: HA-peptide/Kd complexes were purified by HPLC size exclusion chromatography and biotinylated. Tumor-infiltrating lymphocytes were extracted by mechanical disaggregation of tumor. For analysis, 1 × 106 lymphocytes were blocked in purified anti-mouse CD16/CD32 (FcγIII/IIR; BD PharMingen, San Diego, CA), then stained with the HA tetramer for 2 h at room temperature. Samples were then incubated with FITC-labeled anti-CD8 Abs for 30 min. Data were acquired on a FACScan flow cytometer, and analyzed using CellQuest software (BD Immunocytometry Systems). BALB/c mice were lethally irradiated with 900 rad and then injected i.v. with 5 × 106 BALB/c or BALB/c.H-2b T-depleted bone marrow cells (1, 2). The next day each recipient was injected i.p. with 50 μl of Thy-1-specific ascites (T24) to remove residual T cells. Mice were left to reconstitute for at least 6 wk before use. The “in vivo CTL assay” examines effector CTL function so it has some significant advantages over the in vitro CTL precursor expansion assay, including the avoidance of many of the in vitro artifacts generated by the latter assay and the selective expansion of CD8 populations. It was performed as previously described (17). Experimental groups were injected i.v. with 200 μl of differentially CFSE-labeled splenocytes per mouse. Eighteen hours later, experimental mice were culled and single cell suspensions were prepared from the DLN, contralateral LN, MLN, and spleens. Analysis was performed on a FACScan (BD Biosciences, Mountain View, CA) using CellQuest software. The cytotoxic ability of the host CD8+ population is measured by monitoring the loss of the peptide-labeled CFSEHIGH peak as compared with the control CFSELOW peak (as per Ref. 17). Single cell suspensions of lymphocytes were washed and resuspended in RPMI 1640 with 5% FCS at 2 × 105 cells per well in 50 μl, and seeded into 96-well flat-bottom tissue culture plates (BD Biosciences). Some wells were precoated with 200 μl of antimurine CD3 (mAb KT3.2; American Type Culture Collection, Manassas, VA; 1 mg/ml in PBS) overnight at 4°C, otherwise CL4 peptide was added to the cultures at concentrations of 1, 0.1, and 0.01 μg/ml. After a 48-h incubation, wells were pulsed with [3H]thymidine (1 μCi/well) for 15 h, and harvested onto filter paper for scintillation counting. All assays were done in triplicate. Data comparing differences between groups was assessed using a Student’s t test or the Mann-Whitney U nonparametric test. Differences between tumor growth rates were compared using ANOVA. Kaplan-Meier survival curves were compared using the log rank test. Differences were considered significant when the p value was <0.05. Statistical analysis was conducted using the SPSS for Windows program and the GraphPad Prism program (GraphPad Software, San Diego, CA). To confirm that the HA Ag was cross-presented by donor APCs rather than directly presented by the host tumor cells, bone marrow reconstitution experiments were performed. HA cross-presentation, measured by adoptive transfer of CFSE-labeled CD8 cells into the animals as described in Materials and Methods, was restored in irradiated mice that received BALB/c marrow, i.e., with APCs that bore the H-2d MHC restriction elements required to present the class I HA peptide to host CD8 cells. HA cross-presentation was not restored in animals that received BALB/c.H-2b marrow, i.e., by cells that expressed H-2b and therefore could not present this peptide (Fig. 1⇓). Thus, only when the host bone marrow-derived APC expressed the correct MHC haplotype was HA presented to HA-specific T cells. This indicates that the tumor does not directly present HA, but requires cross-presentation by host APC. Tumor Ag cross-presentation to host CD8 cells requires host APCs. To determine whether host APCs were required for tumor Ag presentation, BALB/c mice were either studied intact (A) or lethally irradiated to 900 rad and then injected i.v. with 5 × 106 T-depleted bone marrow cells from BALB/c (B; i.e., which could present the peptide) or BALB/c. H-2b (C; i.e., which could not present the peptide). Shown are CFSE proliferation analyses in the tumor-DLN of these reconstituted mice bearing the AB1-HA tumor. The in vitro sensitivity of AB1-HA to gemcitabine was established using the colorimetric MTT assay to determine the IC50 of the drug on this cell line. The IC50 of the gemcitabine-resistant cell line AB1-HA-GR250 was >800-fold higher (data not shown). To examine in vivo sensitivity to gemcitabine, mice were given standard therapy on a third daily schedule for five doses, 9 days after AB1-HA tumor inoculation. Tumor sizes ranged from just palpable to 2 × 2 mm. Mice treated with gemcitabine showed a decrease in tumor size and significant growth delay of tumors compared with control treatment (p < 0.05) (Fig. 2⇓A). 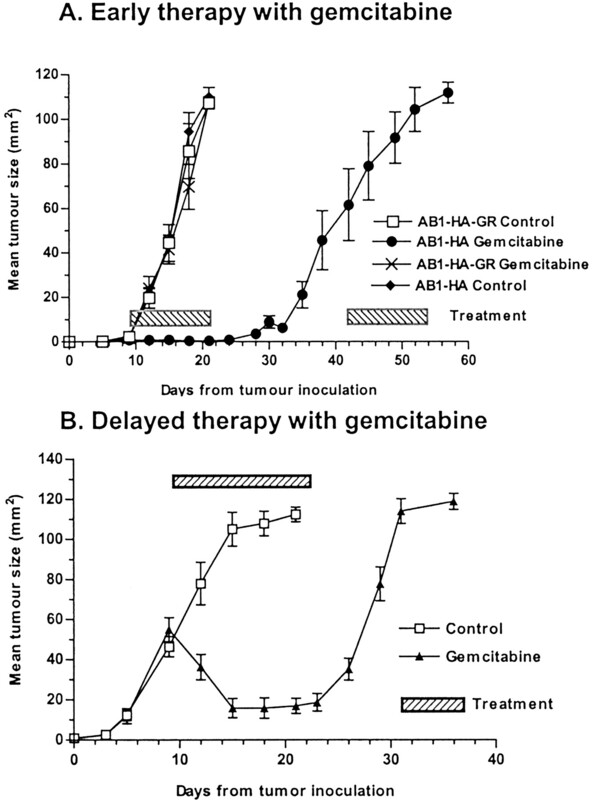 When mice bearing the gemcitabine-resistant AB1-HA-GR250 tumor were similarly treated (Fig. 2⇓A), there was no change in tumor growth rate between mice receiving gemcitabine or control injections. To quantify the amount of tumor shrinkage induced by gemcitabine, the effect of gemcitabine on larger established tumors was examined by starting treatment when tumor size reached ∼50 mm2. These tumors showed an early decrease in size followed by a plateau after ∼81% shrinkage on tumor volume in vivo (Fig. 2⇓B). Tumor regrowth almost always occurred several days after the end of treatment. 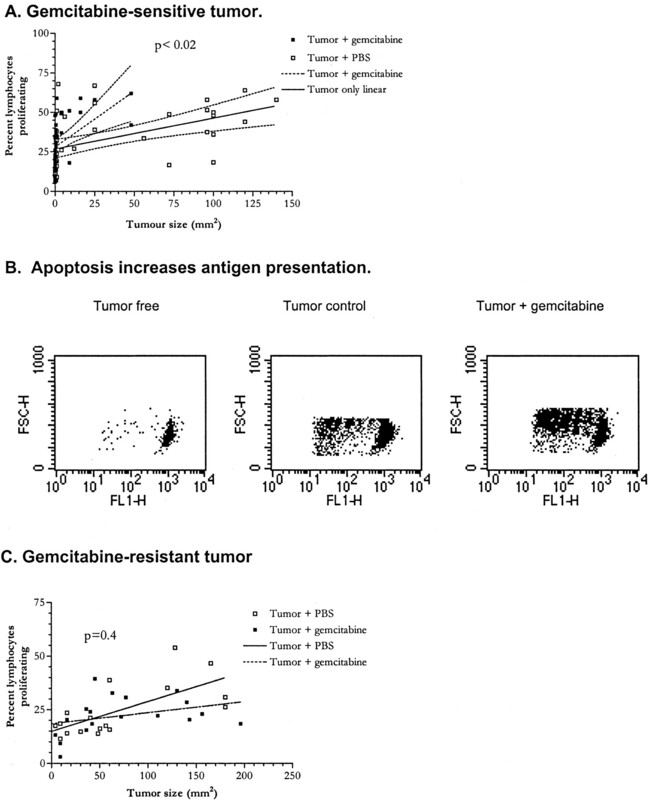 The apoptosis-inducing agent gemcitabine induces regression of the AB1-HA tumor in vivo. A, Early treatment. 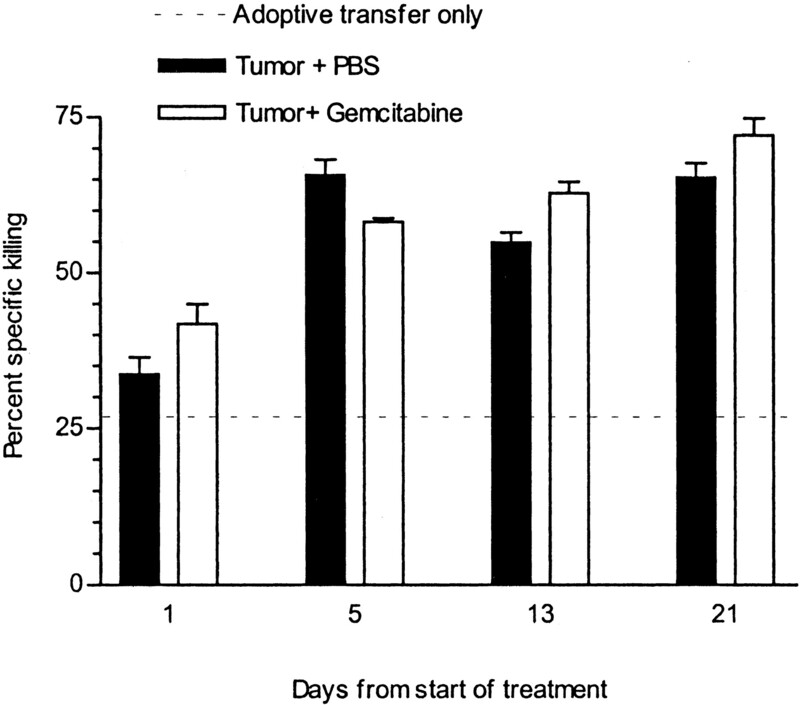 To determine whether this agent could produce tumor regression in vivo, mice (five per group) with established AB1-HA or gemcitabine-resistant AB1-HA-GR250 tumors were treated with five doses of gemcitabine or PBS injection every 3 days from days 9 to 21 after tumor inoculation, and tumor size was evaluated. B, Late treatment. Mice (five per group) with established AB1-HA tumors were treated with five doses of gemcitabine or PBS injection at third daily intervals from when tumors reached a mean size of 50 mm2. Tumor size was calculated as the product of two measurements obtained using calipers. Both experiments were repeated on three occasions with similar results. The effect of apoptotic cell death on cross-presentation was assessed in mice inoculated with AB1-HA tumor then treated with gemcitabine, with tumor Ag-specific proliferation in vivo assessed by analyzing changes in fluorescence in adoptively transferred CFSE-labeled tumor-specific lymphocytes (Fig. 3⇓). Induction of apoptosis in vivo does not result in sequestration of tumor Ags from the cross-presentation pathway. To determine whether apoptosis inducted prevented removed tumor Ags from the cross-presentation pathway, mice were inoculated with (A) AB1-HA tumor or (B) gemcitabine-resistant AB1-HA-GR250 tumor, treated with gemcitabine as described above and a CFSE dilution (“Lyons-Parish”) analysis was undertaken. One, 5, 13, and 21 days after gemcitabine treatment commenced, mice were adoptively transferred with CFSE-labeled cell suspension lymphocytes from naive CL4 mice. Sixty-six hours later, mice were culled and their lymphocytes were analyzed by FACS for proliferative activity, represented as a halving of fluorescence for each division. Results were plotted representing tumor size vs percent proliferating cells adjusted for division number. C, Representative CFSE analyses for gemcitabine-sensitive tumor at a tumor volume of 40 mm2. In tumor-bearing mice treated with control vehicle, there was a gradual increase in tumor size and in the proportion of proliferating adoptively transferred HA-specific CD8 lymphocytes. When mice were treated with gemcitabine, the slope of the line increased significantly (p < 0.02), with increased proliferation seen when related to equivalent tumor size (Fig. 3⇑A). For example, at a size of 40 mm2, Ag presentation from tumor that had been treated with gemcitabine was nearly double that of animals given PBS alone (Fig. 3⇑B). This demonstrates that Ag is more available for cross-presentation following gemcitabine treatment, rather than being sequestered from the cross-presentation pathway. This effect was unlikely to be due to prolonged presentation from an “earlier” tumor Ag load as Ag presentation ceased within several days when mice were “cured” of tumor and in animals that rejected allogeneic tumor (data not shown). To determine whether this effect was due to tumor apoptosis or simply a direct effect of gemcitabine increasing the cross-presenting activity of APCs, this experiment was repeated using the gemcitabine-resistant cell line AB1-HA-GR250, as above. When mice bearing the gemcitabine-resistant tumor were treated, there was no significant difference in proliferative activity between animals receiving gemcitabine and those receiving control vehicle (Fig. 3⇑C). Furthermore, when splenocytes of gemcitabine-treated mice were used as APCs in a lymphocyte proliferation assay requiring presentation of specific peptides to untreated HNT or CL4 lymphocytes, there was no difference in proliferation between gemcitabine-treated or control APCs (data not shown). Thus, APC function is not nonspecifically altered by gemcitabine. We assessed deletion of tumor-specific CD8 cells after gemcitabine-induced apoptosis by using tetramers to evaluate tumor-specific CD8 cell numbers in vivo during and after treatment. Mice bearing AB1-HA tumors were treated with gemcitabine or control vehicle and DLN and spleens were removed, made into a single cell suspension and double-stained with anti-CD8 Ab (BD PharMingen) and class I+ MHC-HA tetramer complexes then analyzed by FACS to determine the percentage of CD8+ T cells specific for HA. Despite exposure to increased levels of cross-presented tumor Ag, tumor-specific CD8 T cell numbers in the DLN (Fig. 4⇓A) and spleens (Fig. 4⇓B) of gemcitabine-treated animals were similar to those from control animals. Interestingly, when tumors were examined, there was not only no evidence of reduction of specific CD8 T cells in tumors but in fact a significant increase in the percentage of tetramer-positive cells in gemcitabine-treated animals was observed 13 days after the start of gemcitabine treatment, although there was no significant difference between the groups at 21 days (Fig. 4⇓C). Because examination of a small number of lymphocytes in tumors can be inaccurate, we increased the precursor frequency of tumor-specific T cells by prior adoptive transfer and again, gemcitabine-treated animals exhibited clearly increased proportions of tumor-specific CD8 cells within tumors (Fig. 4⇓D). This pattern in tumors was not present at earlier time points (data not shown). Overall there was no clear evidence that tumor-specific CD8 cells were deleted after gemcitabine-induced tumor apoptosis. Apoptosing tumor cells do not delete CD8. To determine whether exposure of host T cells to Ags from apoptotic tumor cells induced deletion and functional tolerance, these parameters were assayed in mice inoculated with AB1-HA tumor and treated with gemcitabine or control vehicle as described. A and B, Tumor cell apoptosis does not delete tumor-specific CD8 T cells. Five to 21 days after treatment commenced, mice were culled and their DLN (A) and spleens (B) were removed and double-stained for HA-specific lymphocytes using the Kd-HA peptide-PE tetramer and CD8-FITC. The percent of lymphocytes staining double-positive for both tetramer and CD8 is shown. C, Tumor cell apoptosis increases tetramer+ CD8 T cells in tumors. Thirteen and 21 days after treatment commenced, mice were culled and their tumors were double-stained for tumor-infiltrating lymphocytes as above. The percent of lymphocytes staining double-positive for both tetramer and CD8 is shown. D, Tetramer+ CD8 T cells also increase in tumors following adoptive transfer of tumor-specific T cells. To increase the precursor frequency of tumor-specific T cells, 1 × 107 of each of HNT and CL4 lymphocytes were adoptively transferred 1 day before commencing treatment and tetramer analysis were performed on tumor-infiltrating lymphocytes as above. Functional tolerance of tumor-specific CD8 cells after gemcitabine treatment was evaluated by assessing in vivo CTL activity in mice bearing AB1-HA tumor and treated with gemcitabine or control vehicle. CTL activity increased in both groups between days 1 and 5 and at no time was there any significant difference between gemcitabine-treated and control animals in the DLN (Fig. 5⇓) and non-DLN or MLN. Thus gemcitabine-induced apoptosis does not lead to functional tolerance of tumor-specific CD8 cells. Although it was clear that the induction of tumor cell apoptosis neither deleted nor tolerized the tumor-reactive CD8 cell population, additional experiments were required to determine whether apoptotic tumor cells significantly primed the host antitumor immune response in vivo. The proliferative ability of tumor-specific CD8+ T cells following gemcitabine administration was assessed as follows. Mice with small established tumors were treated with a full course of gemcitabine, culled 1, 5, 13, and 21 days after the start of gemcitabine treatment, and their lymphocytes were assessed for proliferation in response to the nonspecific stimulus anti-CD3 and to the class I HA peptide CL4. Although proliferation in response to anti-CD3 was diminished in the lymphocytes of gemcitabine-treated animals, these animals showed significantly greater proliferation to stimulation with the CL4 peptide at all time points. Day five posttreatment is shown as representative of these data (Fig. 6⇓). Apoptotic tumor cells prime CD8 cells. To determine whether tumor-specific CD8 T cells had been primed in vivo by tumor peptides following apoptosis induction, mice were inoculated with AB1-HA tumor and 8 days later were given HNT and CL4 transgenic lymphocytes to increase the precursor frequency of tumor-specific T cells. The following day, mice were treated with gemcitabine or PBS on a third daily schedule. Five days after starting treatment, mice were culled and their LN tested for proliferation to CL4 peptide, plate-bound anti-CD3, or no stimulus. Tumor-free BALB/c LN were also examined. Data shown represent one of three similar experiments and were obtained from four mice per group in triplicate wells. Results were similar between the three experiments. ∗, A value of p < 0.05 between gemcitabine-treated and PBS-treated groups. To further determine whether apoptotic cells primed host antitumor responses, we vaccinated these animals with the HA Ag-bearing PR8 influenza virus in the presence or absence of gemcitabine-induced apoptosis and evaluated tumor growth. Although a minimal delay in tumor growth was demonstrable for PR8 virus alone (Fig. 7⇓A), this was consistently <10% and much smaller in magnitude and duration than the growth delay seen after gemcitabine treatment (Fig. 7⇓B). 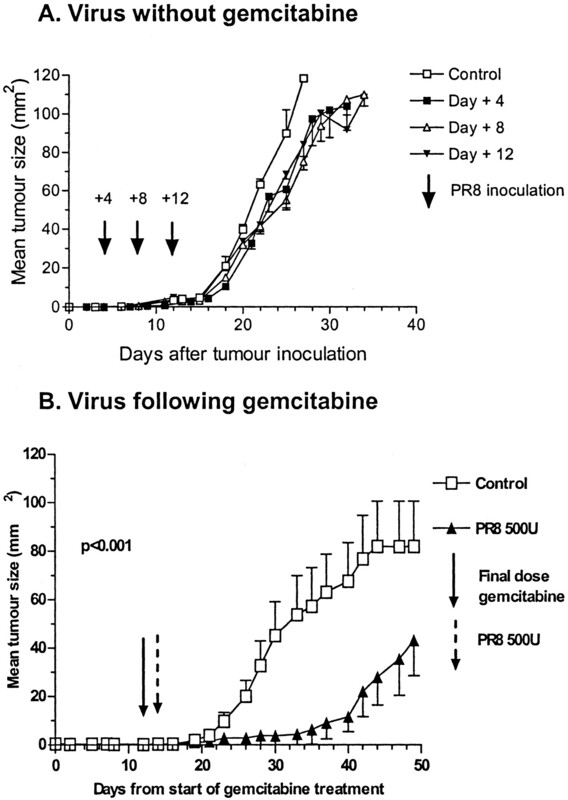 Also, while there was a small increase (p < 0.05) in the median survival of mice receiving PR8 virus without apoptosis induction 4 (+4 days) and 8 (+7 days) days after tumor inoculation, mice treated with PR8 virus after gemcitabine treatment showed a 16-day increase in median survival (p < 0.05) compared with mice treated with gemcitabine alone (Fig. 7⇓B). In addition, when occasional mice (< 2%) were cured of established tumor using gemcitabine alone, they were subsequently resistant to rechallenge with the same tumor and did not show any ongoing Ag presentation (data not shown). This priming effect of tumor apoptosis induction was further confirmed by studies of activating anti-CD40 Ab FGK45 administration after gemcitabine-induced apoptosis induction where synergistic effects were seen in delaying tumor regrowth and curing a proportion of mice (A. Nowak, B. W. Robinson, and R. Labe, manuscript in preparation). Thus, gemcitabine-induced tumor cell apoptosis clearly primes host antitumor responses in vivo. Apoptotic cells prime host antitumor immune responses in vivo. A, Groups of 10 mice were inoculated with AB1-HA tumor. Four, 8, and 12 days after tumor inoculation, mice were vaccinated with 500 U of PR8 virus or control vehicle i.p. without receiving any gemcitabine therapy. B, Groups of 10 mice were inoculated with AB1-HA tumor, treated with gemcitabine as above, then, 2 days after the final dose, were vaccinated with 500 U of PR8 virus or control vehicle i.p. Mice were monitored for tumor growth rate. Data show one of three separate experiments with similar results. Cross-presentation of peripheral tissue Ags has been demonstrated for a number of tissues and is thought to be important for development of tolerance and the induction of immune responses to tissue Ags (2). Although cross-presentation of tumor Ags has been demonstrated by a number of investigators, there is still uncertainty regarding the resulting response of tumor-specific CD8 cells (4). The CD8 response is likely to be influenced by the viability of the tumor cell containing the cross-presented Ag, but it remains uncertain whether the cellular source of cross-presented Ags in vivo is live or dead cells (1). Because phagocytosis of cells dying by apoptosis in vivo is exceptionally efficient, it has been theorized that tumor cell apoptosis could result in Ag sequestration (29) and that when that process is overwhelmed or fails, the host would respond by tolerance induction (8, 30). This sequence of events is integral to the “danger theory” which proposes that only necrotic cell death, particularly when associated with cellular stress, should lead to the induction of immune responses of the sort likely to destroy tissue, e.g., antitumor responses (31). However, it has been proposed that when massive apoptosis occurs, the normally efficient phagocytic system is overwhelmed, resulting in secondary necrosis in vivo, release of proinflammatory mediators, and an increase in cross-presentation (30). Because until now it has not been possible to accurately analyze in vivo specific tumor Ag cross-presentation and tolerance induction following in vivo apoptosis, we established a transfection-transgenic model of tumor immunity in which each of those processes could be analyzed. The transfected marker Ag enabled tumor-specific responses to be studied in vivo, and the availability of transgenic mice with large numbers of T cells expressing TCRs with specificity for that Ag enabled the level, location, and kinetics of Ag cross-presentation to be evaluated in vivo. Importantly, the tumor was sensitive to in vivo apoptosis induction by gemcitabine at doses that did not significantly otherwise alter the key immunological events being studied. The data clearly demonstrate that apoptotic tumor cells are not sequestered from cross-presentation pathways and that tumor-specific CD8 cells which respond to cross-presented tumor Ags from apoptotic cells are not deleted and are primed rather than tolerized in the process. The requirement for host APCs demonstrated by the bone marrow chimera experiments confirms that the tumor Ag (HA) is cross-presented rather than directly presented by the tumor cells in the DLN. This is consistent with the lack of any evidence that this tumor metastasizes to LN (32). This cross-presentation of tumor Ag in DLN is efficient and tumor Ag cross-presentation is seen throughout the period of tumor growth, i.e., is constitutive (26). This parallels observations in normal rats where apoptotic bodies have been demonstrated to be constitutively present in APCs draining the normal gut, implying continuous sampling of apoptotic gut epithelial cells (33). The only cellular source of the cross-presented Ag in our experiments was the tumor cell, although it was impossible to know whether the cells that donated tumor Ag were alive, apoptotic, or necrotic. The latter was unlikely as staining of tissue sections demonstrated no evidence of either tumor necrosis or the inflammation usually associated with necrosis in these tumors with or without gemcitabine therapy. Therefore, the source of cross-presented Ag was likely to be either apoptotic or live cells. As it is technically not possible to precisely identify which type of cell delivers tumor Ags for cross-presentation in vivo, we chose the strategy of inducing a large shift in the balance of live to apoptotic tumor cells in vivo by inducing substantial apoptosis pharmacologically, then determined how this affected cross-presentation and T cell responses. As expected, in our experiments gemcitabine induced tumor cell apoptosis in vitro and caused shrinkage of tumor in vivo (20, 22). This was dependent upon the continued presence of the drug, as cessation of gemcitabine administration was associated with rapid outgrowth of the remaining tumor cells within 1 wk, mimicking clinical experience with noncurative cytotoxic chemotherapy. With the induction of massive tumor cell apoptosis, which reduced tumor volume by ∼80%, no reduction in tumor Ag cross-presentation was seen. Indeed, when corrected for tumor size and hence peripheral tumor Ag load, cross-presentation of tumor Ag approximately doubled. This supports the view that apoptotic cells are efficiently cross-presented. If live cells were the only source of such Ags, cross-presentation should have declined following this large shift from live to apoptotic cells in vivo. Furthermore, our observation that the gemcitabine-treated drug-resistant line did not exhibit the same increase in tumor Ag cross-presentation confirmed that the results were due to the induction of tumor cell death and not due to any nonspecific augmenting effects of the drug itself on the cross-presenting functions of APCs. Cross-presentation has been reported as a mechanism of induction of tolerance by deletion of specific CD8+ T cells, a process known as “cross-tolerance,” and, importantly, this has been described for the Ag used in our studies (HA). Ins-HA mice expressing the HA on the pancreatic islets do not develop insulitis. In this system, cross-presentation of islet HA occurs and is followed by rapid activation and deletion of CD8+ T cells (34). Deletional tolerance has also been demonstrated following cross-presentation of self Ags from the pancreas of mice expressing the model autoantigen OVA in this site (35). Tolerization by CD8+ deletion has also been demonstrated in the thymus (36). In contrast, our data do not demonstrate any decrease in numbers of HA-specific CD8 T cells following the increase in cross-presentation mediated by gemcitabine-induced apoptosis. Indeed, numbers of tumor-specific CD8 T cells within tumors increased up to 3 wk after induction of apoptosis commenced. This strongly suggests that cross-presentation of Ags from apoptotic cells is not a deletional event. Sherman and coworkers (34) showed, using HA-specific T cells in the nontumor INS-HA transgenic model where HA is expressed in the pancreas, that tolerance in the CD8 compartment occurred as a consequence of cross-presentation and was dose-dependent (34). Apoptosis of pancreatic islet cells has also been demonstrated to induce tolerance in vivo (17). Therefore, it is crucial to understand the fate of CD8 cells that respond to cross-presented tumor Ags in vivo because it provides essential information for planning tumor immunotherapy studies. If apoptotic cells induce tolerance, then any increased load of apoptotic cells that ensued from administration of a cytotoxic agent like gemcitabine might be expected to provide strong tolerogenic signals, rendering immunotherapeutic strategies useless. Our demonstration that an HA-expressing tumor induces effector CTL by day 10 and that progressive tumor growth, with its increased load of cross-presented tumor Ags, does not substantially reduce the level of CTL activity supports the view that growing solid tumors are not tolerogenic to CD8 cells per se. This is supported by our previous studies using OVA as the model tumor Ag in C57/BL6 mice where no tolerance of tumor-specific CD8 cells was observed over 4 wk of tumor growth (37). This effect contrasts to the outcome that occurs following the in vitro loading of DCs with tumor Ags, where tolerance in the CD8 compartment has been observed, a process thought to be due to a combination of maturational block, suppression of responsiveness, and the induction of suppressive molecules such as IL-10, transforming growth factor β, and PGE (7). Overall, our data do not support a view that the induction of tumor apoptosis in vivo tolerizes the tumor-specific CD8 response. If CD8 T cell activation was an automatic result of increased Ag cross-presentation then the induction of apoptosis in vivo by chemotherapy drugs like gemcitabine would be expected to induce some level of immunity. For example, one might expect prolonged recurrence-free intervals following chemotherapy and the detection of new delayed-type hypersensitivity skin test reactivities to tumors. This is not the usual clinical experience as most advanced cancers recur soon after cessation of chemotherapy. Clearly, in our experiments, while there is increased Ag cross-presentation and CD8 tolerance was not induced, it was important to determine whether apoptosis induction was a “null event” or in some way primed the host antitumor CD8 response. Our observation that apoptotic cell death primed CD8 T cells for an increased proliferative response to HA peptide is further supported by the demonstration that postapoptosis administration of tumor Ag-containing virus markedly slowed tumor growth. These data are consistent with the notion that the cross-presentation of tumor Ags from apoptosing tumor cells is not in fact a null event but provides a level of priming. This is confirmed by the demonstration of increased tumor-specific CD8 responses in vitro following apoptosis induction. It is also consistent with the observation that mice exhibiting complete regressions following gemcitabine therapy alone (∼2% of treated animals) were immune to rechallenge (data not shown) and, indirectly, by the demonstration of increased numbers of tumor-infiltrating lymphocytes following apoptosis induction. It is possible that this priming is only apparent, and is simply a reflection of the increased Ag dose delivered to the DLN following apoptosis induction, but in other experiments increased dose alone has not been enough to prime host CD8 cells (37). It is more likely that the induction of apoptosis altered the context in which the tumor Ag was delivered. There are two main candidate mechanisms for this. 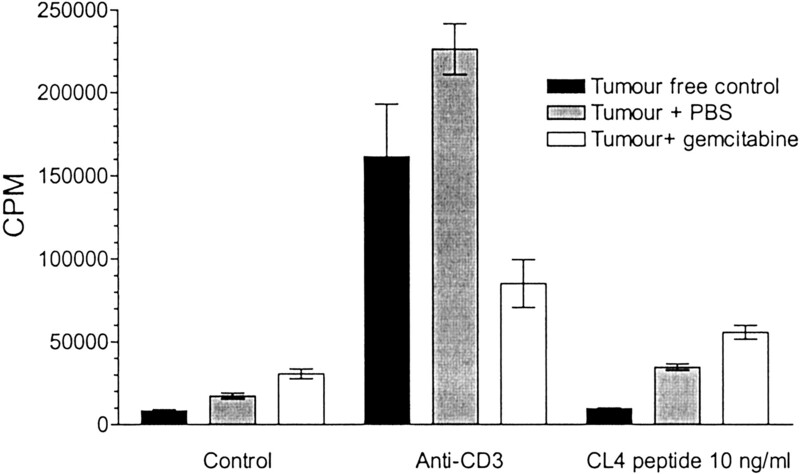 First, chemotherapeutic agents can increase the level of some stress proteins expressed by cells (38), and these proteins are capable of stimulating host antitumor responses that may be sufficient to induce CD8 responses to the cross-presented tumor Ag (39). Second, the increased phagocytosis of apoptotic tumor cells by tumor-associated macrophages, one of the main sources of the proinflammatory cytokines that underlie the “cancer syndrome” of weight loss, anorexia, and lethargy, may augment the release of these proinflammatory cytokines and thus increase the responsiveness of APCs to cross-presented tumor Ags (40). Considered together, our findings show that tumor Ags from apoptotic cells, when cross-presented to host CD8 cells, do not induce tolerance in these CD8 cells as occurs with in vitro-cultured DCs (6), nonobese diabetic mice with apoptotic pancreatic β cells (17), and class II-positive B cell tumors (41), and that a level of CD8 priming results. There have been few studies combining apoptosis-inducing chemotherapy and immunotherapy in cancer, presumably because it has been assumed that chemotherapy is so immunosuppressive that it would negate any potential benefits from immunotherapy (42). Simultaneous administration of immunotherapy agents which prime DCs, such as IFN α and TNF-α, has been used with chemotherapy (43, 44, 45, 46). Although this has some scientific logic, particularly in stimulating the capacity of the DCs cross-presenting the increased Ag load to promote CD8 differentiation, these combinations have often proven to be toxic. Previously published literature in this area have been limited for variety of reasons, such as an inability to study specific antitumor reactivity due to a lack of defined tumor Ags and limitations in assays available for analysis of CD8 function in vivo. One of the most widely studied agents is cyclophosphamide, which can prime CD8 responses via a process thought to include suppression of regulatory T cells (47). It is important to make it clear that gemcitabine is not simply acting in a similar way–if that were so, similar results would of course have been seen when gemcitabine was administered to gemcitabine-resistant tumors, although of course we cannot completely exclude a contributory effect of gemcitabine-induced changes in lymphocyte numbers or function in these studies. Chemotherapy-induced apoptotic destruction of tumor cells exposes the host immune system to large amounts of tumor Ag. Although this is not enough alone to initiate a powerful antitumor response it does prime the host immune system for “adjuvant” immunotherapy. In this study it was noteworthy that ∼10% of animals whose established tumors regressed following gemcitabine plus influenza vaccination showed no evidence of recurrence up to 6 mo following therapy, i.e., were “cured,” a phenomenon rarely seen with the tumor used in this study or with other aggressive solid tumors. This has several implications for planning tumor immunotherapy trials. First, it suggests that the level of cross-presented tumor Ag from established tumors is not limiting. Therefore, therapy in such situations is better aimed at boosting responses to endogenous cross-presented tumor Ag rather than delivering extra Ag. Second, as drug therapy protocols using apoptosis-inducing agents like gemcitabine can prime antitumor immune responses, combining this therapy with immunotherapy is logical. Third, as postchemotherapy delivery of immunostimulation was more effective rather than pretreatment, the timing of such immunotherapy may be critical. As not all chemotherapy induces apoptosis, not all drugs act by the same mechanisms, and individual tumors can express different mechanisms of resistance to apoptosis (48, 49, 50), we cannot conclude that all agents would have this immune priming effect. Thus this study, which provides understanding of the host T cell responses to specific tumor Ags following chemotherapy, is a foundation for deciding which immunotherapeutic approaches may enable the immune system to mount a strong antitumor response to chemotherapy-induced tumor lysis. We thank the Pharmacy Department at Sir Charles Gairdner Hospital for supplying and dispensing the gemcitabine used in this study and Maree Brannigan for her help in typing the manuscript. ↵1 A.K.N. was the recipient of an Eva K. A. Nelson scholarship. R.A.L. was supported by the Medical Research and Compensation Foundation of Australia. A.L.M. was a recipient of a Dora Lush scholarship. ↵2 Current address: Division of Immunology, University of Connecticut Health Center, Farmington, CT 06030. ↵3 Current address: Institute of Reproduction and Development, Monash University, Clayton, Australia 3168. ↵5 Abbreviations used in this paper: DC, dendritic cell; LN, lymph node; HA, hemagglutinin; CL4, clone 4; DLN, draining LN; MLN, mesenteric LN; HNT, •••. Heath, W. R., F. R. Carbone. 2001. Cross-presentation, dendritic cells, tolerance and immunity. Annu. Rev. Immunol. 19:47. Heath, W. R., F. R. Carbone. 2001. Cross-presentation in viral immunity and self-tolerance. Nat. Rev. Immunol. 1:126.
den Haan, J. M., S. M. Lehar, M. J. Bevan. 2000. CD8+ but not CD8− dendritic cells cross-prime cytotoxic T cells in vivo. J. Exp. Med. 192:1685. Zinkernagel, R.. 2002. On cross-priming of MHC class I-specific CTL: rule or exception?. Eur. J. Immunol. 32:2385. Albert, M. L., S. F. Pearce, L. M. Francisco, B. Sauter, P. Roy, R. L. Silverstein, N. Bhardwaj. 1998. Immature dendritic cells phagocytose apoptotic cells via αvβ5 and CD36, and cross-present antigens to cytotoxic T lymphocytes. J. Exp. Med. 188:1359. Reiter, I., B. Krammer, G. Schwamberger. 1999. Cutting edge: differential effect of apoptotic versus necrotic tumor cells on macrophage antitumor activities. J. Immunol. 163:1730. Fonteneau, J. F., M. Larsson, N. Bhardwaj. 2001. Dendritic cell-dead cell interactions: implications and relevance for immunotherapy. J. Immunother. 24:294. Restifo, N. P.. 2000. Building better vaccines: how apoptotic cell death can induce inflammation and activate innate and adaptive immunity. Curr. Opin. Immunol. 12:597. Henry, F., L. Bretaudeau, A. Hequet, I. Barbieux, B. Lieubeau, K. Meflah, M. Gregoire. 1999. Role of antigen-presenting cells in long-term antitumor response based on tumor-derived apoptotic body vaccination. Pathobiology 67:306. Witham, T. F., M. L. Erff, H. Okada, W. H. Chambers, I. F. Pollack. 2002. 7-Hydroxystaurosporine-induced apoptosis in 9L glioma cells provides an effective antigen source for dendritic cells and yields a potent vaccine strategy in an intracranial glioma model. Neurosurgery 50:1327. Kotera, Y., K. Shimizu, J. J. Mule. 2001. Comparative analysis of necrotic and apoptotic tumor cells as a source of antigen(s) in dendritic cell-based immunization. Cancer Res. 61:8105. Albert, M. L., B. Sauter, N. Bhardwaj. 1998. Dendritic cells acquire antigen from apoptotic cells and induce class I-restricted CTLs. Nature 392:86. Shaif-Muthana, M., C. McIntyre, K. Sisley, I. Rennie, A. Murray. 2000. Dead or alive: immunogenicity of human melanoma cells when presented by dendritic cells. Cancer Res. 60:6441. Hoffmann, T. K., N. Meidenbauer, G. Dworacki, H. Kanaya, T. L. Whiteside. 2000. Generation of tumor-specific T-lymphocytes by cross-priming with human dendritic cells ingesting apoptotic tumor cells. Cancer Res. 60:3542. Hugues, S., E. Mougneau, W. Ferlin, D. Jeske, P. Hofman, D. Homann, L. Beaudoin, C. Schrike, M. Von Herrath, A. Lehuen, N. Glaichenhaus. 2002. Tolerance to islet antigens and prevention from diabetes induced by limited apoptosis of pancreatic β cells. Immunity 16:169. Marzo, A. L., B. F. Kinnear, R. A. Lake, J. J. Frelinger, E. J. Collins, B. W. Robinson, B. Scott. 2000. Tumor-specific CD4+ T cells have a major “post-licensing” role in CTL mediated anti-tumor immunity. J. Immunol. 165:6047. Allen, P. M., K. M. Murphy. 2002. Lymphocyte activation and effector functions: in vivo veritas. Curr. Opin. Immunol. 14:291. Dallal, R. M., M. T. Lotze. 2000. The dendritic cell and human cancer vaccines. Curr. Opin. Immunol. 12:583. Makin, G., C. Dive. 2001. Apoptosis and cancer chemotherapy. Trends Cell Biol. 11:S22. Nowak, A. K., B. W. Robinson, R. A. Lake. 2002. Gemcitabine exerts a selective effect on the humoral immune response: implications for combination chemo-immunotherapy. Cancer Res. 62:2353. Cartee, L., G. L. Kucera. 1998. Gemcitabine induces programmed cell death and activates protein kinase C in BG-1 human ovarian cancer cells. Cancer Chemother. Pharmacol. 41:403. Morgan, D. J., R. Liblau, B. Scott, S. Fleck, H. O. McDevitt, N. Sarvetnick, D. Lo, L. A. Sherman. 1996. CD8+ T cell-mediated spontaneous diabetes in neonatal mice. J. Immunol. 157:978. Scott, B., R. Liblau, S. Degermann, L. A. Marconi, L. Ogata, A. J. Caton, H. O. McDevitt, D. Lo. 1994. A role for non-MHC genetic polymorphism in susceptibility to spontaneous autoimmunity. Immunity 1:73. Davis, M. R., L. S. Manning, D. Whitaker, M. J. Garlepp, B. W. Robinson. 1992. Establishment of a murine model of malignant mesothelioma. Int. J. Cancer 52:881. Marzo, A. L., R. A. Lake, D. Lo, L. Sherman, A. McWilliam, D. Nelson, B. W. Robinson, B. Scott. 1999. Tumor antigens are constitutively presented in the draining lymph nodes. J. Immunol. 162:5838. Braakhuis, B. J., V. W. Ruiz van Haperen, E. Boven, G. Veerman, G. J. Peters. 1995. Schedule-dependent antitumor effect of gemcitabine in in vivo model system. Semin. Oncol. 22:42. Lyons, A. B., C. R. Parish. 1994. Determination of lymphocyte division by flow cytometry. J. Immunol. Methods. 171:131. Fadok, V. A., D. L. Bratton, P. M. Henson. 2001. Phagocyte receptors for apoptotic cells: recognition, uptake, and consequences. J. Clin. Invest. 108:957. Rovere, P., M. G. Sabbadini, C. Vallinoto, U. Fascio, V. S. Zimmermann, A. Bondanza, P. Ricciardi-Castagnoli, A. A. Manfredi. 1999. Delayed clearance of apoptotic lymphoma cells allows cross-presentation of intracellular antigens by mature dendritic cells. J. Leukocyte Biol. 66:345. Marzo, A. L., R. A. Lake, B. W. Robinson, B. Scott. 1999. T-cell receptor transgenic analysis of tumor-specific CD8 and CD4 responses in the eradication of solid tumors. Cancer Res. 59:1071. Huang, F. P., N. Platt, M. Wykes, J. R. Major, T. J. Powell, C. D. Jenkins, G. G. MacPherson. 2000. A discrete subpopulation of dendritic cells transports apoptotic intestinal epithelial cells to T cell areas of mesenteric lymph nodes. J. Exp. Med. 191:435. Morgan, D. J., H. T. Kreuwel, L. A. Sherman. 1999. Antigen concentration and precursor frequency determine the rate of CD8+ T cell tolerance to peripherally expressed antigens. J. Immunol. 163:723. Kurts, C., H. Kosaka, F. R. Carbone, J. F. Miller, W. R. Heath. 1997. Class I-restricted cross-presentation of exogenous self-antigens leads to deletion of autoreactive CD8+ T cells. J. Exp. Med. 186:239. Merkenschlager, M., M. O. Power, H. Pircher, A. G. Fisher. 1999. Intrathymic deletion of MHC class I-restricted cytotoxic T cell precursors by constitutive cross-presentation of exogenous antigen. Eur. J. Immunol. 29:1477. Nelson, D. J., S. Mukherjee, C. Bundell, S. Fisher, D. van Hagen, B. Robinson. 2001. Tumor progression despite efficient tumor antigen cross-presentation and effective “arming” of tumor antigen-specific CTL. J. Immunol. 166:5557. Ohtsuboa, T., E. Kanob, K. Uedac, H. Matsumotob, T. Saitoa, S. Hayashib, M. Hatashitab, Z. Jinb, H. Saitoa. 2000. Enhancement of heat-induced heat shock protein (hsp)72 accumulation by doxorubicin in vitro. Cancer Lett. 159:49. Srivastava, P.. 2002. Interaction of heat shock proteins with peptides and antigen presenting cells: chaperoning of the innate and adaptive immune responses. Annu. Rev. Immunol. 20:395. Fadok, V. A., D. L. Bratton, L. Guthrie, P. M. Henson. 2001. Differential effects of apoptotic versus lysed cells on macrophage production of cytokines: role of proteases. J. Immunol. 166:6847. Staveley-O’Carroll, K., E. Sotomayor, J. Montgomery, I. Borrello, L. Hwang, S. Fein, D. Pardoll, H. Levitsky. 1998. Induction of antigen-specific T cell anergy: an early event in the course of tumor progression. Proc. Natl. Acad. Sci. USA 95:1178. Buzaid, A. C.. 2000. Strategies for combining chemotherapy and biotherapy in melanoma. Cancer Control 7:185.
ten Hagen, T. L., A. L. Seynhaeve, S. T. van Tiel, D. J. Ruiter, A. M. Eggermont. 2002. Pegylated liposomal tumor necrosis factor-α results in reduced toxicity and synergistic antitumor activity after systemic administration in combination with liposomal doxorubicin (Doxil) in soft tissue sarcoma-bearing rats. Int. J. Cancer 97:115. Sakon, M., H. Nagano, K. Dono, S. Nakamori, K. Umeshita, A. Yamada, S. Kawata, Y. Imai, S. Iijima, M. Monden. 2002. Combined intraarterial 5-fluorouracil and subcutaneous interferon-α therapy for advanced hepatocellular carcinoma with tumor thrombi in the major portal branches. Cancer 94:435. Gibbs, P., C. Anderson, N. Pearlman, S. LaClaire, M. Becker, K. Gatlin, M. O’Driscoll, J. Stephens, R. Gonzalez. 2002. A phase II study of neoadjuvant biochemotherapy for stage III melanoma. Cancer 94:470. Young, A. M., J. Marsden, A. Goodman, A. Burton, J. A. Dunn. 2001. Prospective randomized comparison of dacarbazine (DTIC) versus DTIC plus interferon-α (IFN-α) in metastatic melanoma. Clin. Oncol. (R. Coll. Radiol.). 13:458. Berd, D.. 1989. Low doses of chemotherapy to inhibit suppressor T cells. Prog. Clin. Biol. Res. 288:449. Gottesman, M. M.. 2002. Mechanisms of cancer drug resistance. Annu. Rev. Med. 53:615. Makin, G.. 2002. Targeting apoptosis in cancer chemotherapy. Expert Opin. Ther. Targets 6:73. Inoue, S., A. E. Salah-Eldin, K. Omoteyama. 2001. Apoptosis and anticancer drug resistance. Hum. Cell. 14:211.